A policy change on infiltrators, starting today? Promising to begin enforcing an addendum to a law on infiltrators that was passed in January, the Population and Immigration Authority said Sunday that anyone who crosses Israel's southern border illegally will be detained for up to three years, and will not be allowed into urban centers. According to numbers from the Interior Ministry's Population Registry, dozens and sometimes hundreds of illegal migrants cross the border every night. In May, over 2,000 reportedly entered Israel. A detention center slated to house them is not yet ready, but the authorities say that in the meantime they will use free space in the Saharonim detention center next to Ketziot Prison and other spaces provided by the Israel Prisons Service. However, enforcing the regulations against illegal migration also requires new orders from the Defense Ministry that will allow long-term detention as per the new legislation, in place of existing policy that allows migrants to be held for up to 10 days only. "As far as we are concerned, enforcement of the new law can begin as planned, starting this morning," the Defense Ministry told Ynet. "However, there are a few technical matters that must be addressed, but as far as the Defense Ministry is concerned, nothing prevents the law from going into effect from today." Population Registry figures show that some 60,000 migrants are currently living in Israel. Thus far, anyone caught by the IDF crossing the border has been detained in Saharonim. Most of them are Sudanese and Eritrean citizens who are released a few days later after questioning, without any clarification of their eligibility for refugee status. The majority receive visas and "temporary protection" status, and are given travel vouchers. With those in hand, they make their way to the city centers – mainly south Tel Aviv, Arad, and Eilat. The mass migration to these areas is causing a wave of protest among the permanent residents. In south Tel Aviv's Shapira neighborhood, home to a large migrant community, locals feel that the authorities have failed to stand by them and that they have thus far have not seen even a suggestion of a solution to the new reality with which they have to contend. Last week, a Shapira neighborhood activists' committee met in their local community center to try and put together a plan to come up with solutions to the difficult situation. "We are sick of the public debate that shows stereotypical pictures, like a 50-year-old lady walking around without her hair combed, that give the impression of 'Oooh, how scary – there are Sudanese here," one activist said. "It's time that the problem was really discussed, that we're offered real solutions," she continued. The neighborhood activists have decided to try and coalesce a broad spectrum of experts and professionals that will address the issues of the migrant population in the area, similar to those called in for last summer's social justice protests. The recommendations will be published in a mission statement that will serve as the basis for the residents' demands from MKs. Thus, denizens of south Tel Aviv hope to make it clear that the infiltrator issue is a national emergency. 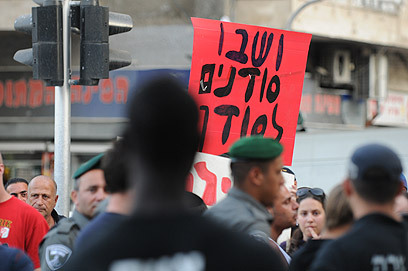 Residents of south Tel Aviv are not holding back their criticism of Tel Aviv Mayor Ron Huldai, who they claim has not made himself available to discuss the migrant problem. "How is the city helping us? Let the mayor come here and sit with us, so he can really understand the story," said Yoav. In response, the Tel Aviv Municipality said that the mayor had worked on the migrant issue for years, long before the matter was in the headlines. The city said Huldai was cooperating with local residents, including the Shapira neighborhood committee, to ease the burden. "(The mayor) has met with residents many times and will continue to do so. The city's directors are in constant contact with neighborhood representatives. We tour on a regular basis to identify and fix the problem. To that end, the municipality has put together a city aid plan as a cost of NIS 60 million, without any contribution from the government." According to the city, the plan calls for regular discussions, some of which would include the mayor. "The plan includes refurbishments to (those) neighborhoods and bolstering public safety – patrols with the police, more streetlights, new infrastructure and better sanitation, investment in schools, new community workers, a camera system, and more." "The municipality invites the neighborhood committee to appoint a permanent representative to take part in these meetings with city leaders, and this month's meeting with the city's director-general." 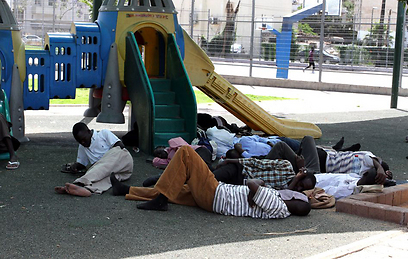 See all talkbacks "Israel mulling long-term detention of illegal migrants "